Antarctica’s Ross Ice Shelf covers an area the size of France and measures a few hundred meters thick above the water. It plays a critical role in stabilizing the West Antarctic Ice Sheet, and scientists are concerned about its future in a warming world. In the field, a team of scientists from Lamont-Doherty Earth Observatory, Scripps Institution of Oceanography and the U.S. Geological Survey is flying over the Ross Ice Sheet, using the IcePod—an assemblage of radars and other instruments bolted to the fuselage of a C-130—to study how the ice, ocean and underlying land interact. They call it the Rosetta project, named after the enigmatic stone containing a script in three languages that led to the decoding of an ancient language. Back at home, they are joined by geologists from Colorado College and oceanographers from ESR to work through the data. After what seemed a multitude of small setbacks due to weather and plane repairs, Rosetta’s third season came to an end amid a flurry of last minute flights, packing, and saying goodbye to our new friends. The last few days flew by as we cleared out our tent on Williams Field, disassembling our equipment, and returning borrowed equipment to the proper departments. Packing down here is done carefully. Everything we had brought down to the tent had to be checked off a list, packed in its proper container, labelled for shipping, placed on a metal pallet, weighed and labelled by weight for packing, put back on a metal pallet, and finally sent off for shipping. I’m glad my own things did not need to go through such a rigorous process, though I bet I would lose fewer possessions if I was this meticulous! Among the 14 of us, the whole process went by quickly, and the tent that we had considered our little corner of Antarctica emptied in just two days. But enough is never enough when you have traveled so far for data. Almost out of nowhere we were given a surprise opportunity to fly one of our survey lines on the second-to-last day of our Antarctic season and we jumped at it! While it wasn’t possible to unpack all of our instruments, the careful packing and labeling of the pallets allowed us to readily locate what we needed. In a final burst of unpacking we had our gravimeters together and were ready to go. There is always time for more data. For the return trip I was tasked with carrying one of two copies of our scientific data (there is always redundancy in data this hard to collect). I carried a hard plastic suitcase filled with a dozen thumbdrives and more than 70 hard drives, equaling 70 pounds of memory, from McMurdo Station, Antarctica to New York City. Some readers may be wondering why we used such a physically demanding method of sending data home. Even in 2017, there is no means of transferring data as safely and as quickly as a graduate student carrying a bag of hard drives! After some huffing and puffing, and some odd looks from security personnel, I delivered the data to Lamont-Doherty Earth Observatory outside NYC for our archivists to put onto the server. Map of Rosetta flight lines for the three seasons of work. Spacing at 10 km resolution for the bottom (northern) and most of the southern section of the map. Other areas are at 20 km spacing. What have we accomplished this third field season? Ultimately, after flight cancellations due to more than a week of harsh weather and airplane technical issues, we were able to complete fourteen of the eighteen flights we planned for this Antarctic season. In total, we had roughly 260 hours of flying over an area the size of Texas. 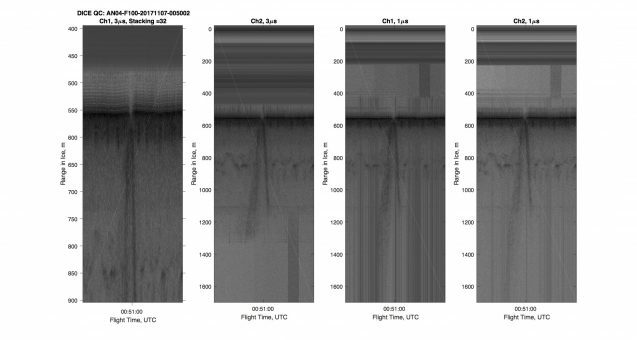 The goal of the Rosetta-Ice project was to use airplane-mounted sensors to create a 10-km resolution grid of geophysical measurements of the Ross Ice Shelf’s glaciology and geology. After three Antarctic field seasons, our mapping is finished. In the northern (bottom) two-thirds of our survey grid we have created a 10-km resolution map, and in the remaining third of the surveyed area we have a 20 km-resolution map. The data collection phase of our project is over, but the analysis of the data is ongoing. 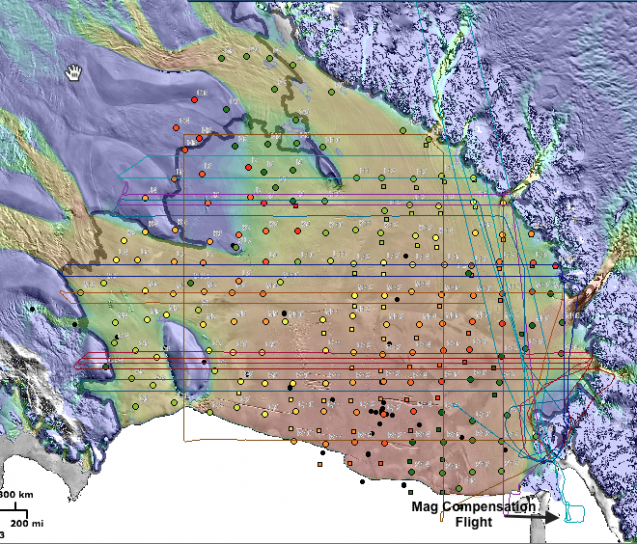 With the new, higher resolution map of the Ross Ice Shelf and the underlying seafloor, previously unseen small-scale features can be identified and studied. Research assistant Isabel Cordero has been working on ‘picking’ the ice layers of the radar echograms, identifying the layers of accumulated ice from the various glacial sources, for the past year. I’m looking forward to the day when, in a few months time, we print out all the radar echograms that we collected, with the ice layers and interesting points labelled for everyone to peruse. Radar flight line L700, a slice across the front of the Ross Ice Shelf that shows the separate ice packets from series of glaciers around the shelf. On the western side (the left), Roosevelt Island is clearly identifiable pushing up under the ice. In the coming months, we will be presenting our initial findings. But for several years we will continue to dig in to the data, as we seek to answer the research questions that led our project in the beginning. The goals for Rosetta-Ice were to answer questions about the conditions on top of and inside the Ross Ice Shelf’s ice, as well as the conditions in the ocean water circulation and rocky bed beneath the ice, and look at linkages. The most exciting aspect of finishing a scientific project is not just what questions can be answered, but what new questions will develop as we learn more about the Ross Ice Shelf and Antarctica as a whole. For further updates about our project keep checking back to our project site. The author, Julian Spergel on Castle Rock, Antarctica for a final look at the vast white continent before ‘wheels up’. This will be my final blog entry, and I would like to finish on a personal anecdote. At the beginning of my time on this blog, I wrote about how coming to Antarctica was a personal goal of mine. On my last hike in Antarctica, a five-hour trek to a large rock crag called “Castle Rock,” I had a moment where, as I looked out over the landscape, I felt a sense of completion. Standing in the middle of a flat, windswept field of snow and ice and watching the snow-covered volcano Mt. Erebus smoke white steam into the sunny blue sky, I thought: “This is Antarctica. All my life, I have imagined what it would be like to be here, and here I am, and it is even more majestic than I thought.” I did my best to memorize every detail of the scene: the cold, the silence, the vividness of the colors. There was so much of Antarctica that I would never be able to see, and the freshness of my memories of being here would soon fade, but if I could just remember this moment, it would be enough. I was so lucky to be able to visit this remote corner of our planet. I only wanted to return again soon, to see and learn more. Before I knew it, I was stepping out of the plane in Christchurch, inhaling my first scents of plant life in over a month. Julian Spergel is a graduate student at the Department of Earth and Environmental Science at Lamont-Doherty Earth Observatory. He works with Professor Jonathan Kingslake on analyzing spatial and temporal trends of supraglacial lakes on the Antarctic Ice Sheet using satellite imagery. He graduated with a B.S. in Geophysical Sciences from the University of Chicago in 2016. He has been involved with a number of diverse projects and has been interested in polar studies since early in his career. His fieldwork has brought him north to the Svalbard Archipelago and south to McMurdo Station, Antarctica. Learn more about previous years’ research, here. For more on this project, please visit the project website. Thanksgiving week at McMurdo has brought warm, clear weather, so it is hopeful we will have a full week of back-to-back flights in our second-to-last week. The weather was perfect for the annual Antarctic “Turkey Trot” 5k race. The Rosetta Project‘s very own Chloe Gustafson won first place, and holds the honor of being the first woman to win the race! 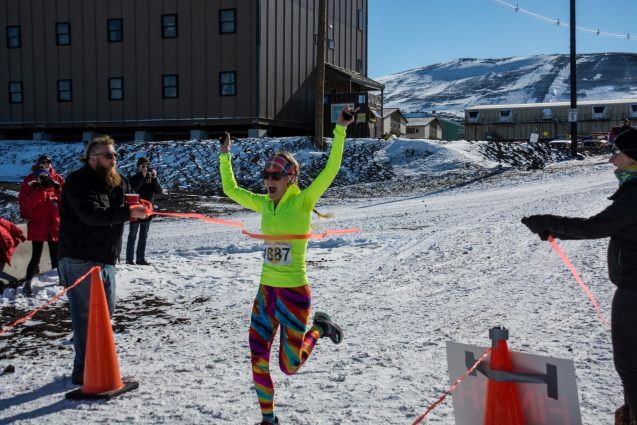 Chloe Gustafson won first place in the Antarctic Turkey Trot and holds the honor of being the first woman to win the race! The warm weather has also begun to melt the snow around the station, turning it mushy and revealing the dirt underneath the ice that we had forgotten was there. The landscape of McMurdo changed over the course of a number of hours, from ice- and snow-covered to “mud season.” As the ground surface becomes darker, it absorbs more heat, and the surrounding ice melts faster. This process, called ice-albedo feedback, is one that is driving a majority of the accelerated change in both poles. Sea ice images collected from IcePod from the Rosetta Project. We observed another rapidly changing part of the Antarctic landscape during a recent Rosetta survey flight that skirted the edge of the ice shelf to observe sea ice, icebergs, and areas of persistent open water called ‘polynyas’. Icebergs are chunks of glacier that break off into the ocean. We saw ‘tabular icebergs’–boxy chunks of ice that still have sharp vertical walls after breaking off the ice shelf. On our flight, most of the icebergs I saw were frozen into the sea ice, like ice islands sticking out from a frozen ocean. Sea ice forms from the freezing of ocean water: small chunks of ice called ‘new ice’ grow and merge into sheets of thin sea ice, which then accumulate snow. While it is still in motion, the ice is called ‘drift ice,’ but once it freezes to the front of the ice shelf or the sea bed, it is called ‘fast ice.’ The fractured tiles of sea ice and dark water looked like stained glass, and it was incredible to see the variety of patterns and the shifting colors of light reflected in the icy seascape below. 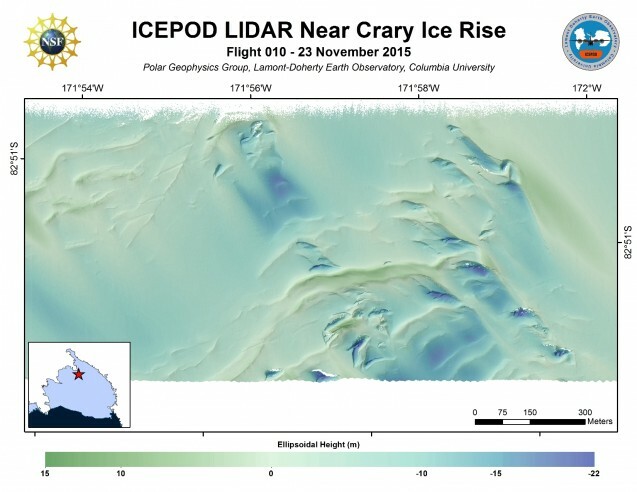 Lidar image of sea ice shot from the IcePod. The ice carries a look of intricately woven lace. 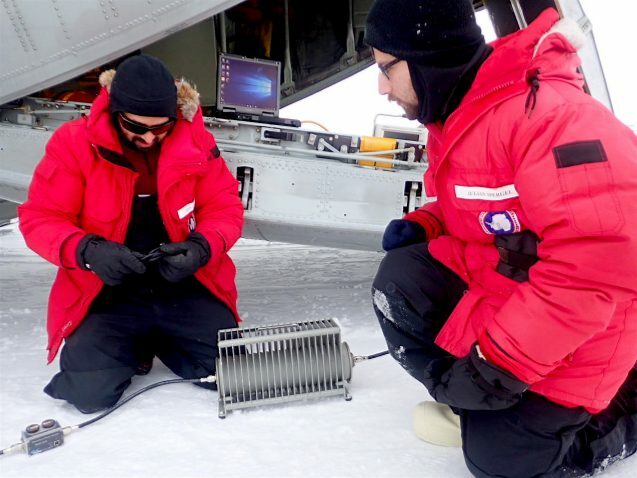 In collaboration with the University of San Antonio project Polynyas and Ice Production in the Ross Sea (PIPERS), we used IcePOD, our aircraft-mounted suite of sensors, to help measure the thickness of the sea ice and get a better understanding of temporal and spatial patterns of air-sea-ice interactions. 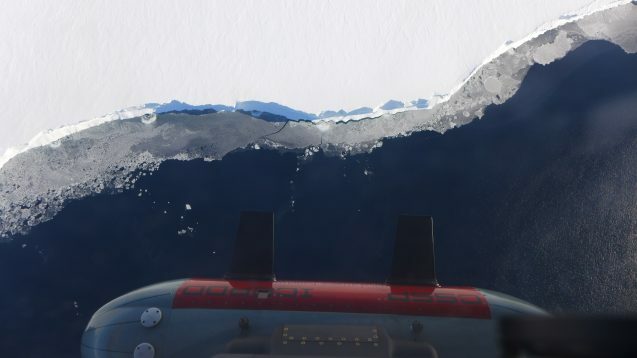 The cracks and gaps in the sea ice were of special interest to the PIPERS scientists, who are studying the evolution of polynyas in the Ross Sea, which are caused by upwelling water or wind currents. You can learn more about PIPERS on their website. A new species of sea anemone called Edwardsiella andrillae. This species lives with most of its column in the ice shelf, with only the tentacled crown extending into the seawater below. A and B show the specimens in situ. Red dots are 10 cm apart. Image: ANDRILL 200 Coulman High Project /SCINI. Understanding sea ice is important to polar biology and polar oceanography. The sea ice hosts a unique ecology of animals and bacteria. Penguins, seals, and other marine animals use the sea ice. Species of photosythetic plankton live on the bottoms of sea ice chunks. 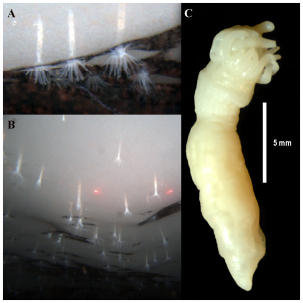 Famously, the ANDRILL project discovered a previously unknown species of sea anemone, Edwardsiella andrillae, that lives clinging to the underside of the sea ice in the Ross Sea. Sea ice also plays a role in keeping the polar oceans cold, reflecting the Sun’s energy off its shiny white surfaces back into space. Lastly, as sea ice freezes, salt is squeezed out into the surrounding water, making it denser and thus causing it to sink. This downward push helps to drive the conveyor belt-like circulation of surface water from the equator to the poles, and the bottom water circulation from the poles to the equator. This is called thermohaline circulation. Thus, sea ice plays a role in the Earth’s oceans, both locally in the Antarctic and worldwide. 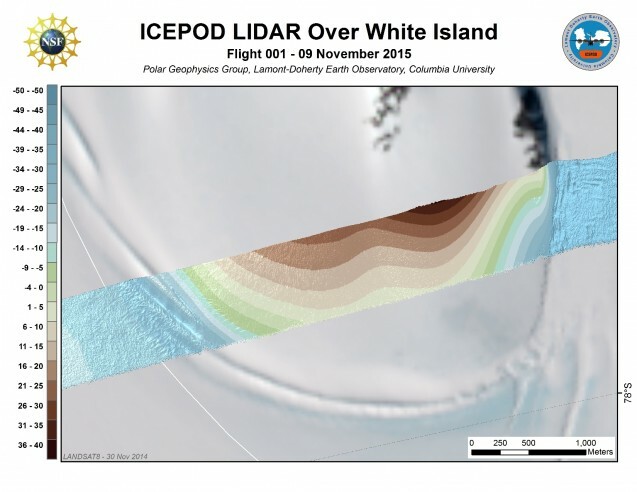 Why did the scientists of PIPERS want to use IcePod when flying over their sea ice study area? Not for the ice-penetrating radar, which looked very confusing after processing–both the shallow and deep ice radar instruments are intended for looking through hundreds of feet of ice, not a few feet of sea ice. But our LiDAR (Light Detection And Ranging) returned some beautiful three-dimensional images of the sea ice-topography. 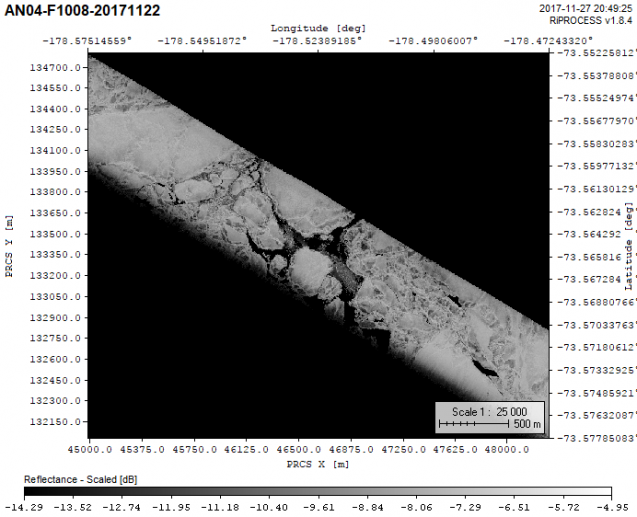 They can use these high-definition images to study small details of the ice. Ice threaded with leads of open water that show up dark black against the white ice. These dark areas absorb energy from the sun causing a feedback loop. 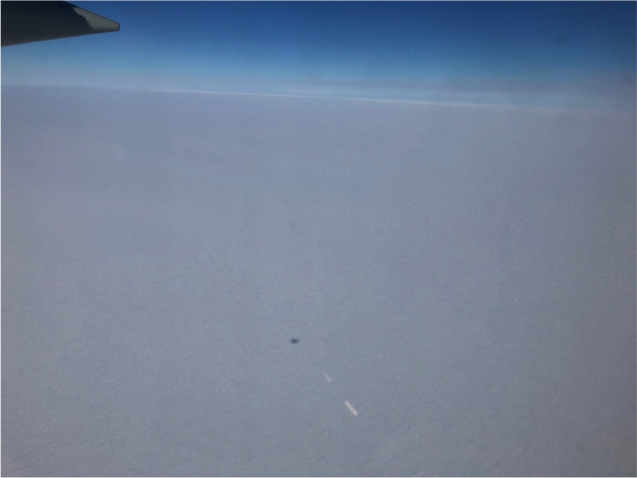 Flying over the sea ice was a treat for the flight’s passengers, myself included, but it was not the most interesting flight for the trip’s IcePod flight engineer, Tej Dhakal. I asked him what kinds of terrain are the most interesting to fly over as he is monitoring the instruments. He said that he enjoyed flying over areas where the instruments reveal hidden details: the Crary Ice Rise, a large mound of ice forming over a rise in the seabed below that is only really visible in the radar echograms, and the Siple Coast, where a sharp change in radar returns indicates precisely where the coastline sits, which is often different than what has been previously mapped. The Trans-Antarctic Mountains are interesting because there is a high density of crevassing. Hopefully this week’s remaining flights will add this kind of interest. Wendell seal mother pops up from the hole in the ice to communicate with her pup. In seal news, the baby seal, whom I’ve named Boopy, has grown much larger and is nearly ready to go for its first swim. 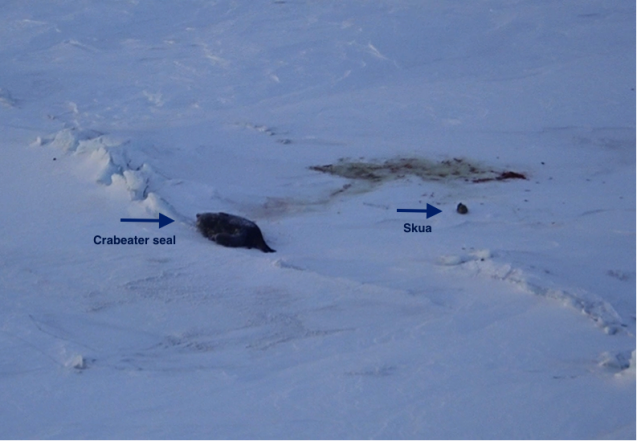 Its mother popped out of the ice hole to yell at it to not bother the larger seal lying nearby. For more information about Rosetta-Ice, check out our website and the archive of this blog. Have questions about Rosetta-Ice or about living and working in Antarctica? Feel free to email your question to juliansantarctica@gmail.com, and I will try to answer it in the next blog entry! 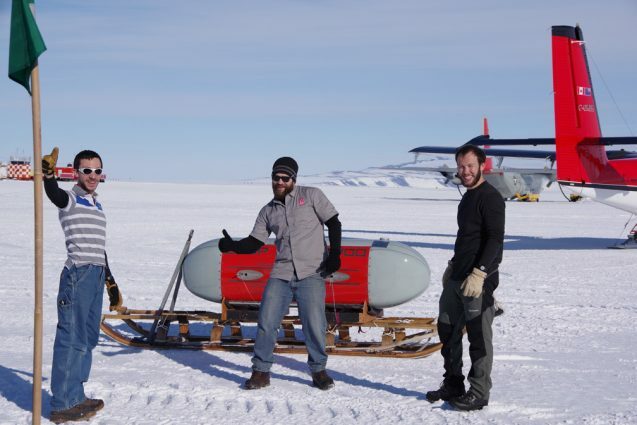 Julian Spergel is a graduate student at the Department of Earth and Environmental Science at Lamont-Doherty Earth Observatory and is blogging from Antarctica. He works with Professor Jonathan Kingslake on analyzing spatial and temporal trends of supraglacial lakes on the Antarctic Ice Sheet using satellite imagery. The theme of the past week has been the weather. Weather is of course always happening, but in the lingo of McMurdo Station, ‘weather’ means ‘bad weather.’ Over the past week, I’ve seen the accumulation of around six inches of very fluffy snow. Radar image from McMurdo weather website Nov. 21, 2017. 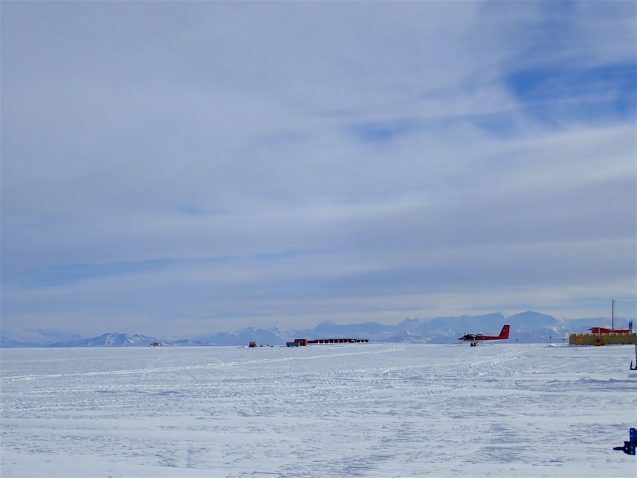 In the center of McMurdo Station, visibility has not yet decreased too much, but on Williams Field there were several days of Condition 1, the most extreme, with visibility of less than one hundred feet. In terms of temperature, it has not gotten too cold, with the thermometer hovering between the mid-teens and low twenties Fahrenheit. Nevertheless, all flights have been grounded for nearly a week. 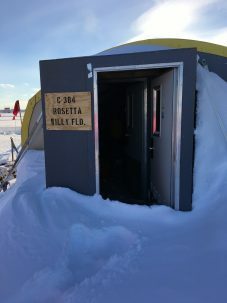 When weather permits, the Rosetta team has been checking in on the instruments in our Williams Field tent and on the airplane, digging out the entrances to the tent, and remaining in a state of preparedness for our next flight opportunity. In between our check-ins the cargo staff went out to investigate and found the back doors of the tent blown open, letting in snow and cold. They relayed to us that the instruments are looking ok, and this was later confirmed by two of the members of the Rosetta team when they were able to make it down to the field. Snow has blown up against the Rosetta Field station providing some good shoveling exercise for the team. Photo J. Spergel. It isn’t all bad news. 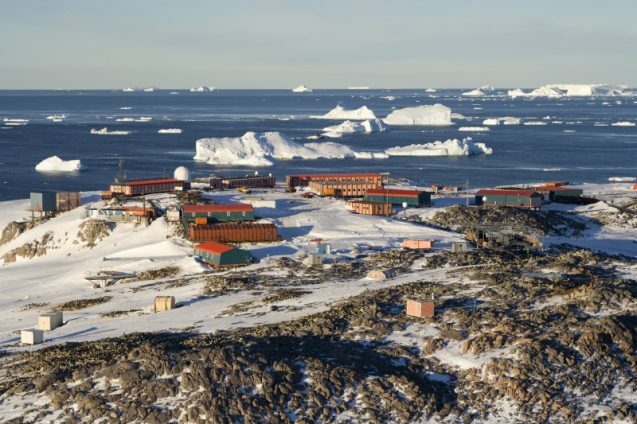 The flights that were going to the South Pole were grounded as well, and the fresh fruits and vegetables that would have gone to them were served to McMurdo Station instead. We enjoyed fresh avocados at every meal for several days as snow blew outside! Their loss was our gain! This austral summer seems to be unusual, with unseasonably active weather. People who have been here in recent years note that the weather during November is normally clear. According to NOAA’s weather statistics for the period 1961-1990, McMurdo Station receives on average a little less than half an inch of snow water equivalent in November. This year, the McMurdo weather office measured nine inches of snow in the 24 hours between 1 A.M. November 16th and 1 A.M. November 17th. This would equal approximately a full inch of snow/water equivalent in just 24 hours! It has been a snowy month. Antarctica is a polar desert, but as mentioned before in this blog, it also experiences extreme weather. The weather patterns of the Ross Ice Shelf in particular have been a topic of research. The triangular Ross Ice Shelf is bordered by the Trans-Antarctic Mountains on one side, the high glaciers of Marie Byrd Land on the second and the Southern Ocean on the third. As a result, the ice shelf experiences a confluence of air masses. From the mountains and glaciers, cold, dense air sinks downslope and flows across the ice shelf in the form of katabatic wind. 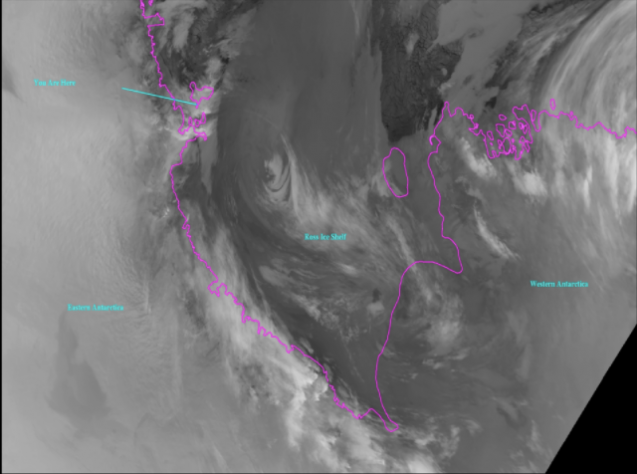 These winds join the clockwise-spinning air mass system coming from the Ross Sea. The high elevation of the mountains acts as a wind barrier and creates barrier winds parallel to the mountain ranges, which also add to the force of the wind vortex. As a result, the cyclonic Ross Ice Shelf Airstream is a permanent, year-round part of the climate. Ross Island, where McMurdo Station is located, sits in the path of this wind and, like a rock in a stream, creates eddies on its leeward, i.e northward, side. Precipitation events occur when relatively warm, moist air is brought to Ross Island, and that moisture is released as snow. 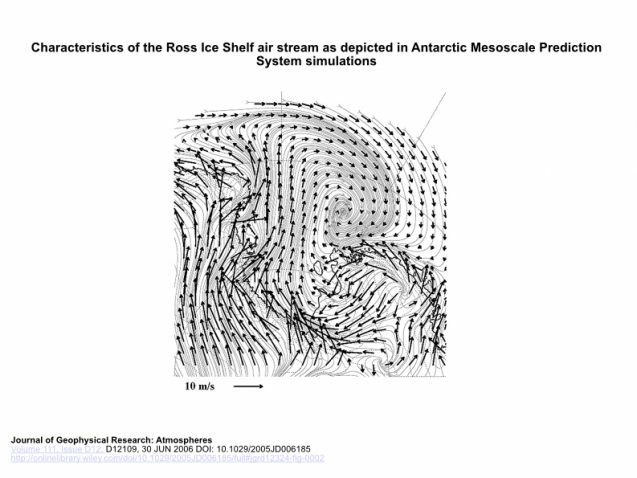 A look at characteristics of the Ross Ice Shelf air stream from a 2006 study. Source: Journal of Geophysical Research: Atmosphere, 2006, Vol 111, Issue D12. As we prepare for our sixth flight of the season, I wanted to offer a glimpse of one of the types of glacial features that we are observing and studying as we map the Ross Ice Shelf: crevasses. The word sends shivers down the spine of anyone whose job involves working on a glacier. These cracks through the glacier can be hundreds of feet deep and hidden beneath a thin layer of snow. They are incredibly treacherous and have claimed the lives of many polar explorers and scientists. They also appear quite frequently in our sensor data as we fly our survey flights for Rosetta-Ice. Crevasses are fractures in a glacier caused by the stresses of movement. They are like the cracks in the surface of clay as one pulls it apart past the limits of elasticity. They most often occur where the flow of a glacier increases, like in a steep deepening valley, and are thus oriented perpendicular to direction of flow. Crevasses that lie in a cross direction are called ‘transverse crevasses.’ There are also longitudinal crevasses that form parallel to ice flow and at an angle to the valley walls. These form as the glacier widens and the ice is pulled apart. 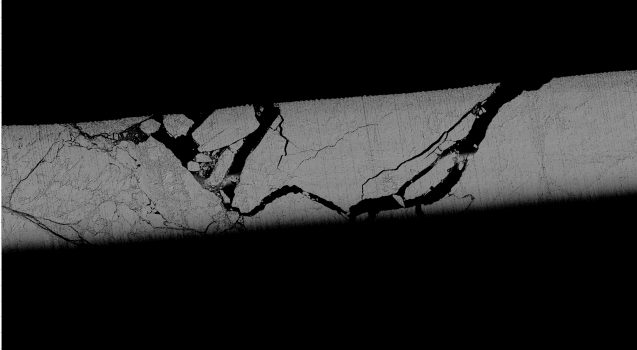 These cracks in the surface of the ice shelf are an easily identifiable marker of areas of high stress within the ice flow. Mapping where crevasses appear is equivalent to mapping where the ice tensional stresses are highest. On an otherwise featureless ice shelf, crevasses show where the different ice flows merge as they flow towards the open sea. Fahnestock et al. (2000) mapped crevasses, rifts, and glacial stretch marks they call “flow lines” on the Ross Ice Shelf in order to study the flow of ice from different glacial source areas to the Ross Sea and how these patterns may have changed in the past thousand years. From their study of the surface features, they were able to draw lines across the Ross Ice Shelf and identify whether a region of ice shelf was flowing in over the Trans-Antarctic Mountains from East Antarctica, or from the rapidly flowing ice streams from West Antarctica, named from southwest to northeast Ice Streams A, B, C, D, and E. A piece of ice takes about one thousand years to travel from the back of the Ross Ice Shelf to the front, and from its surrounding area we can tell where the piece of ice originated. The Rosetta ice-penetrating radar shows us crevasses deep with in the ice. These cracks formed on the surface and were carried along and buried by centuries of snow and glacial flow. In the radar image, buried crevasses appear as thin arches. As the radar beam penetrates through the snow and ice like ripples in a pond, bouncing off of surfaces of changing density, the sharp corner of a crevasse scatters the ripples. When the radar image is processed from the echoes of the broadcasted signal, this sharp point of scattering becomes an arch descending down from an otherwise flat surface. What do these buried crevasses tell us? Like digging to the bottom of a stack of papers on a desk, these ancient crevasses tell us of past glacial events. Their burial depth divided by the local snow accumulation rates gives an estimate for the period of stagnation required to stop flow, fill and bury the crevasses to the observed depth. They indicate past flow conditions, or even the locations of abandoned shear margins, where there used to be a boundary between ice streams moving at differing speeds. Lastly, crevasses are interesting because sometimes fascinating things fall into them. A few studies have shown that wind-blown meteorites get caught in snow-filled crevasses. Knowing where to look for rare meteorites is a huge help to our friends in the astro-geology community. Crevasses are also the places where meltwater drains down to the base of the ice. This affects the slipperiness of the glacier’s bed, and can speed up its flow. Meltwater flowing through crevasses also widens the crack in a process called hydrofracturing. This can further weaken the structural stability around the crevasse, priming the area for a later break. While Rosetta-Ice is not specifically looking for extraterrestrial rocks or draining water, we are on the lookout in our radar data for anything that can tell us about the history or current flow conditions of the Ross Ice Shelf. On another note, we’ve received questions from students at East Harlem School; here are answers to a few of them. Is it possible for plants to grow in Antarctica? Yes, a few. There’s a dozen native species that live on the Antarctic Peninsula, the thin peninsula of land that stretches north into relatively warmer parts of this continent. Everywhere else, only a few lichens (the crinkly stuff that grows on rocks and trees) survive. How do you survive in the cold? What’s the hardest part about living/being in Antarctica? With the right warm clothing and the right behavior, Antarctica’s conditions are very survivable. It’s very important to wear the right layers of clothes because you need to both stay warm, but also not let your sweat stay wet against your skin. I wear a thermal underwear layer that is warm and wicks sweat away. On top of that I’ll either wear a warm shirt or a thin sweater. On top of that, I wear a fleece or wool jacket, and then I wear my big red parka. Everyone has one and we call them our “Big Reds.” On my legs, I wear fleece pants and snowpants. I wear two layers of socks usually, and either my boots or the rubber boots that they gave us, called “Bunny Boots.” When I get too cold, I go inside, out of the wind, to warm up. For me, the hardest part of living in Antarctica is the isolation. I personally use the internet a lot to connect to friends and family, but the combination of the slow internet connection and the time difference makes it difficult. How has global warming affected how much ice will be there in 5 years? We’re certain that the warming of ocean water is melting from underneath the floating ice shelves around Antarctica, and we predict that the warming atmosphere will lead to more melting and calving, but how much global warming-caused ice loss might there be within the next five years? There’s no way to know. What we still don’t know about how Antarctica’s climate works could fill a library. Weather over Antarctica is incredibly unpredictable, and we still cannot tell for sure how the multi-year climate cycles affect melting continent-wide. That question, how will global warming effect ice mass loss in Antarctica, is quite literally a multi-million dollar question. Thousands of scientists are studying every aspect of the Antarctic glacial system to get a sense of what is “natural” — what amounts of ice loss and gain are within the normal range of decades- or century-long cycles — and what can be interpreted as a result of human-caused climate change. Hopefully, Rosetta-Ice will yield a small piece of the puzzle. 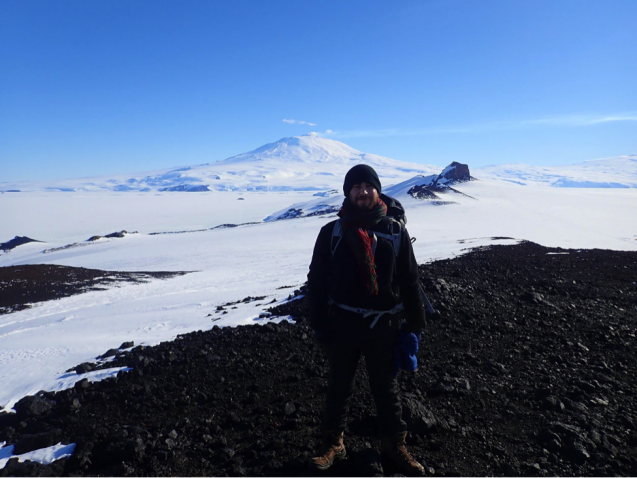 Julian Spergel is a graduate student at the Department of Earth and Environmental Science at Lamont-Doherty Earth Observatory and will be blogging from Antarctica. He works with Professor Jonathan Kingslake on analyzing spatial and temporal trends of supraglacial lakes on the Antarctic Ice Sheet using satellite imagery. At the time I’m writing this, we have completed three survey flights. It feels good to finally be collecting data. The night shift, myself included, has spent the past two days checking the collected data for signs of any instrument breakage or recording errors. Although Peter Pan suggested ‘happy thoughts’ would get us airborne, in Antarctica we are still very much at the will of the weather. Yesterday evening’s flight was cancelled because of fog, and so this morning we wanted to get as much flying in as possible before the late afternoon fog rolled in. 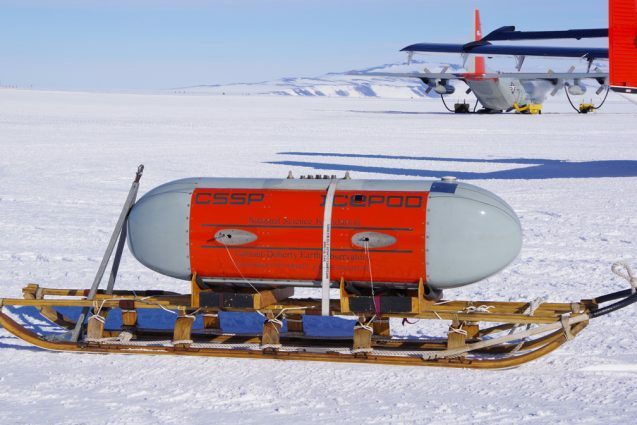 Although the morning shift had to wait a bit for the IcePod instruments and the plane to warm up before departing, they were able to complete two full survey lines before their afternoon return. It is early in the season and I haven’t been able to fly a mission yet myself, but I am eagerly waiting for my first opportunity. Our daily schedule is not the easiest when we fly. This is especially true for those who need to make decisions about our daily activities. Every day, from 4 to 4:30 AM, Kirsty Tinto, our chief scientist, checks to see if that morning’s flight is going ahead. Next, she checks in with the team ending their night shift for updates on instrument functioning. At 5 am, she and the day’s flight engineer meet with the weather operations and flight operations team to go over the day’s flight plan considering the weather forecast. The team has to be flexible when building a daily mission that works with the daily weather constraints. Meanwhile, the gravity instrument operators, affectionately called the “graviteers,” go down to the airfield with the aircraft load-masters to oversee the loading of the gravimeter into the plane. Collecting data on minuscule changes to gravity requires that we know exactly where in the plane the instruments sit to calculate accelerations. 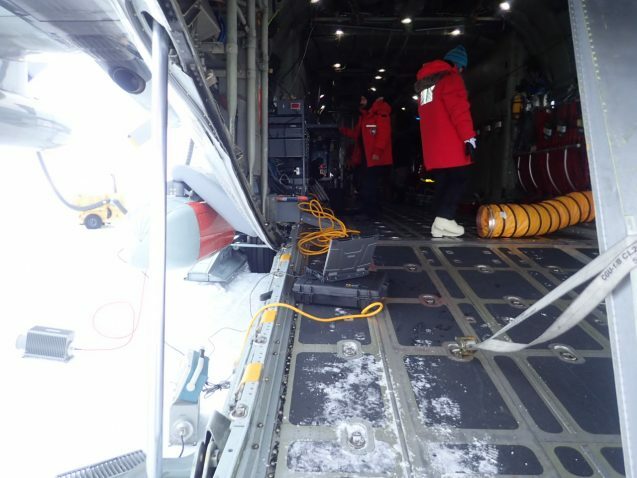 Although it is tempting to leave the sensitive instruments on the plane overnight, the gravimeters must be kept warm at all times for peak functionality, as a result the gravimeters must be loaded and surveyed at the beginning of every day and unloaded at the end of the day. The plane is readied for take-off with a systems check and the flight crew and our project’s flight engineers prepare for flying. The non-flight members of our team arrive to Williams Airfield soon after from our base at McMurdo camp. Every shift has an archivist, someone who copies the data from the various digital storage units carried in flight and then carefully transports them back to the tent. The data is transferred to the central computer, as well as to two backup hard drives for redundancy. At the end of the shift, there are nine hard drives and two USB sticks filled with data. The archivist also selects three to four five-minute segments of data for quality control, which we call “QCing”. The other QCers and I look through the segments from every data set for breaks in the data, for anomalies, and for particularly good or interesting segments. Arguably, the most important data set to check is our positioning-navigation-timing system. None of our data is useful if we cannot precisely place where in the world we were when we collected the data. Some of our instruments must also know precisely the angle and velocity of the plane in order to yield useful data. Once that is checked, we look at the data readouts. If there’s anything surprising within the Ross Ice Shelf, we QCers might be the first ones to know. While it is fun to wonder what we could find, what do we actually see? In the radar data, we can see the surface and bed of the ice shelf and often we can see areas of buried crevasses. In the shallow ice radar, we can often see where different ice masses from geographically disparate glacial sources merge as they flow towards the ocean. 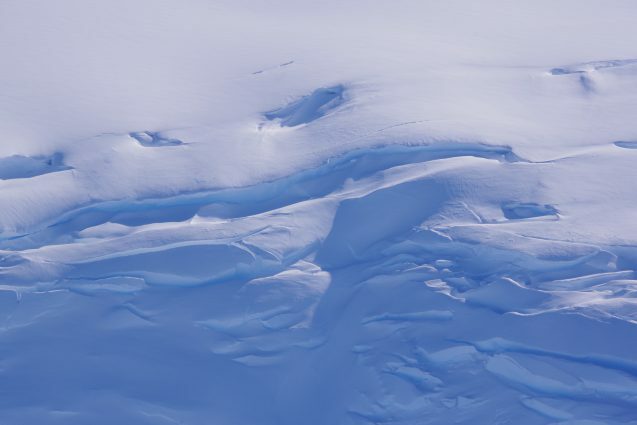 From LiDar (Light Detection and Ranging), we can see very highly detailed maps of the surface of the ice shelf, which can give us information about the flow of the ice and the changing surface climate conditions, i.e. wind and temperature. From gravity and magnetics readings, we can glean information about the size of the cavity under the ice shelf and the ocean bed beneath the water. An aerial photo from our onboard downward facing camera of the edge between the ice and McMurdo Station. At the lower right you can see the circlar shape of a tank. Photo by Susan Howard. 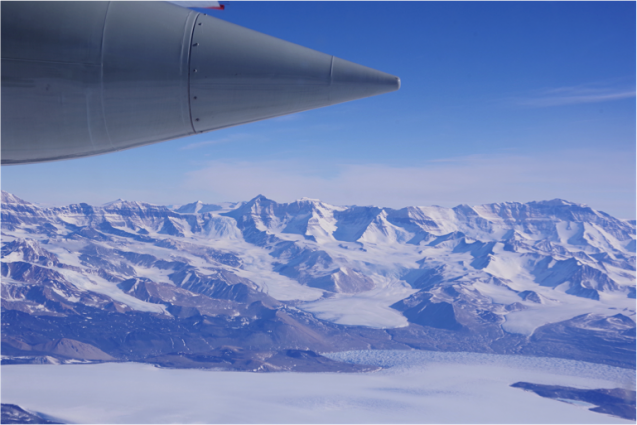 Though we’ve just begun our survey flying, we’re excited to see what our instruments will show us about the Ross Ice Shelf. Weather permitting, we will fly day and night this week pushing through being tired. Yes we are tired, and I know I am guilty of getting a little snippy, but we are down at the edge of the world for valuable scientific work. When I see the sun kiss the horizon, and watch the shadows lengthen for a moment and the snow become golden, I know that this experience will end up being incredible. A mother crab-eater seal nursing her newborn pup. In the background, a skua hungrily eyes the afterbirth. 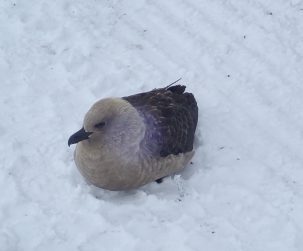 South polar skua are aggressive seabirds, scavengers and carrion eaters, readily scavenging any food source. One of our ‘tough’ Alamo floats is named after a south polar skua. Official ‘proof’! My photo by the McMurdo sign is proof that we have really made it here after a lot of anticipation! The Rosetta team has been in Antarctica for a week now and we’re almost done with unpacking and testing all of our equipment. Our first survey flight of the season is scheduled for the end of the week. The first few days of our time in Antarctica was spent on safety training and ‘waiting on the weather’. Each step of our set-up process, which includes receiving cargo, installing electricity in our tent, unpacking our boxes, and building disassembled instruments, needs to wait for safe weather conditions, which in Antarctica is by no means guaranteed. Our workstation is a yellow Jamesway tent on the airfield named Williams Field. It is about a 30 minute drive from McMurdo Station, on a nearby section of the Ross Ice Shelf. The landscape seems endless with ice shelf merging into white cloudy skies. The airplanes on the ice are close to the only relief. Even though our tent is within a short drive of McMurdo Station (a small town with most of the safety and logistical equipment on the entire continent), we still need to prepare ourselves for sudden, extreme weather. 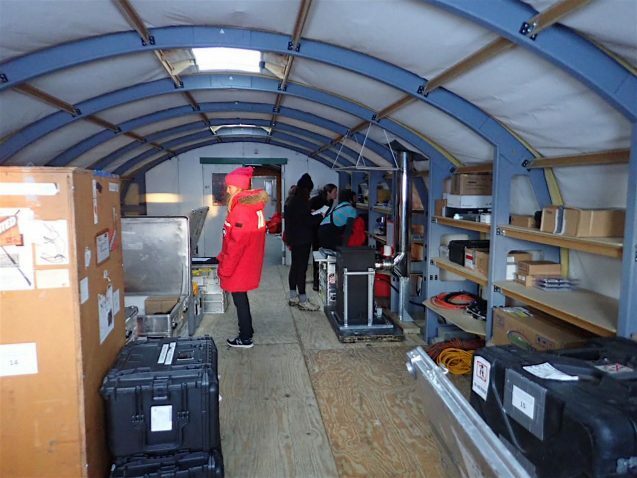 Every time we leave the relative safety of McMurdo, we carry our Extreme Cold Weather equipment and our tent has emergency food and sleeping equipment. Driving onto the ice shelf is a surreal experience: the landscape is a nearly featureless white, flat expanse, with only tiny buildings and the black, slug-like shapes of lounging seals to break up the uniform whiteness. When there are low-lying clouds, the ice and the sky seem to meld into a single white area. Unpacking our workspace in the Jamesway that will be our ‘command center’ during our work here. After two days of unpacking, our little tent is becoming very cozy. We have a line of tables for our computers and printer, a coffee machine and two gas heaters, a number of powerful external hard drive units called a Field Data Management System. Our scientific instruments are coming together, as well. To keep both ourselves and our electronics warm, we keep two heat-stoves running all the time. In preparation for our flights, we’ve split into two shifts, one in the day and one at night. Myself and six other people spent last weekend transitioning our daily schedules to sleeping during the day and being awake to work over the night. Due to the polar latitude, the sun never goes down, so the two shifts experience nearly identical levels of light. Yet my sense of time is very confused and I often forget what day of the week I am currently in. Setting up our basestations to support our flight data. Before we start recording and processing data from our first survey flights, we need to rebuild the instruments that were deconstructed for shipping, and calibrate them to make sure the data recorded is accurate. With round-the-clock activity, we have set up everything in only a few days. One of the needed activities was hanging the gravimeter onto a freely-suspended gimbal with bungee cords so that it is stabilized against the movement of the plane. Many of the components of our sensors are very delicate, but a large number of the external components are larger, easily adjusted, and could be found in a hardware store. Unlike other fields of science, polar fieldwork operates best when adjustments can be made while wearing heavy gloves. 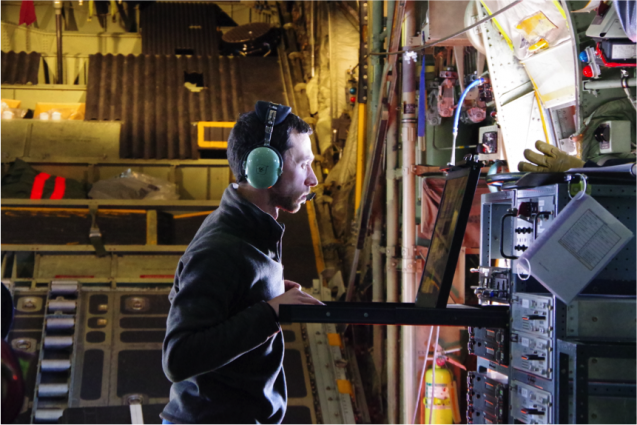 Helping Tej to calibrate the IcePod on the C130 aircraft. Additional set up involves installing “base stations” to record a background level of magnetics and GPS information. 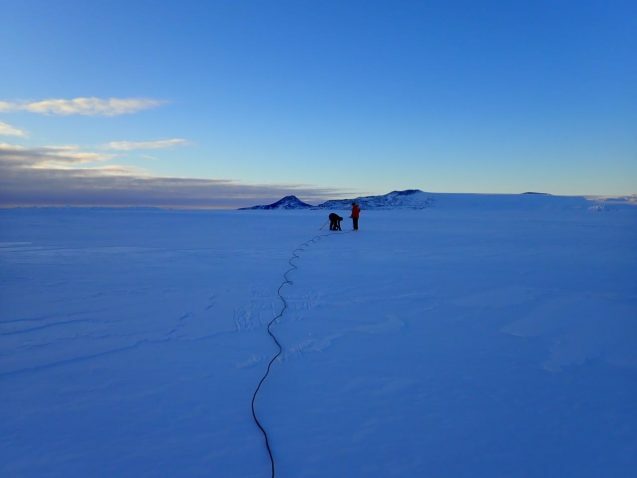 A five-minute walk across the ice from our tent, we have erected two yellow tripods and partially buried a small box of sensors. The instruments are powered by a small solar panel that we set up nearby. Each tripod needed to be secured against wind by tying the legs to bamboo poles we buried in the snow as an anchor. The snow on the ice shelf is incredibly dry and compact, so digging into it feels like digging through Styrofoam. Filling in the holes with snow, stamping on it, and waiting only a few minutes allows the snow to harden to a strength similar to concrete. Checking on the data output inside the plane and hoping for good weather for a flight! Our first test flight is scheduled for the end of the week. We will fly one of our survey lines and make sure that the instruments’ readings are accurate so that on future flights we will know that the instruments are working properly. In addition we will be ensuring that each of the instruments functions by checking sections of the data after every flight. My assigned role once flights are running regularly is to analyze the ice-penetrating radar during the night shift. What’s a Few Days’ Delay When Preparing to Visit a 33 Million-Year-Old Ice Sheet? The Rosetta team has been delayed in Christchurch, NZ since October 20th, and we are all hoping very hard that today (the 24th) will be the day–that the weather will cooperate and the plane will have no issues so that we can get to McMurdo Station and start preparing to work. Morale is still high, we have enjoyed exploring the local sights in Christchurch in the spare time we suddenly have. But it would be a huge inconvenience if we stay here too long. The dangers of Antarctic air travel cannot be emphasized enough. The weather is notoriously temperamental: winds as fast as 199 mph (327km/h) have been recorded at Dumont D’Urville station. Wind gets funneled down mountains and through fjord valleys, picking up speed. Blowing snow can limit visibility in a matter of seconds. Even crossing the Antarctic Circle is dangerous. Because there are no large landmasses to break the 40th line of latitude, ocean and wind currents can spin unimpeded around the continent. This is called the Antarctic Circumpolar Current. Sailors called the latitudes between New Zealand and Antarctica, in order of southernness, the Roaring Forties, the Furious Fifties, and the Shrieking Sixties. Yet this inaccessibility is two-sided. The spinning wall of wind and water acts as a thermal insulator and keeps Antarctica chilly. The extreme environment, the massive ice sheet, and the unique ecosystems that attract the scientific community are all due to this forbidding climate system. Was Antarctica always so inhospitably cold? Surprisingly, no. The development of the Antarctic ice sheets are relatively recent compared to the 4.5 billion-year-old history of the Earth. The precise mechanism that triggered Antarctic glaciation is still debated, but there is significant evidence that continental scale glaciation began around 33 million years ago, at the boundary of the Eocene and Oligocene. A combination of lowering CO2 levels and the formation of the Circumpolar Current when South America and Antarctica detached led the mountain glaciers in the Trans-Antarctic mountains to expand until the continent was covered. 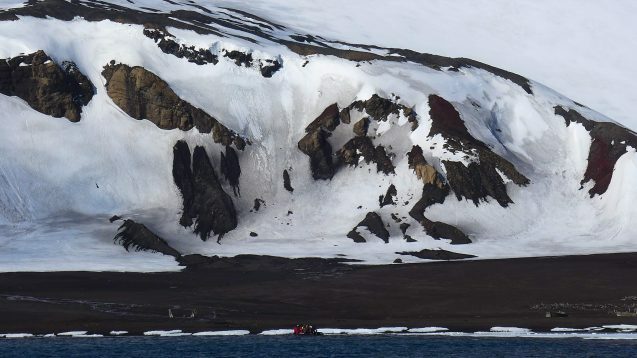 Prior to this point, Antarctica is believed to have been forested, and dinosaur and early mammal fossils have been found around the continent. We theorize that the crustal depression that has become the embayment holding the Ross Ice Shelf developed during the break-up of Gondwana. 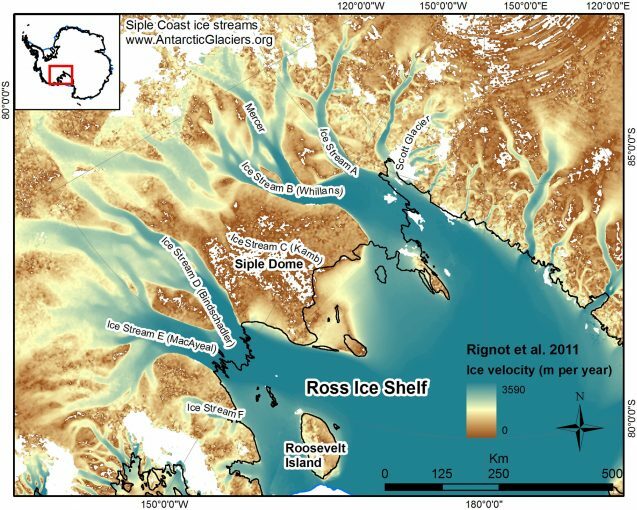 The glacial and geological history of the Ross Embayment, the bay in which the Ross Ice Shelf sits, is one of Rosetta-Ice’s leading research questions. By making measurements of the seafloor, we hope to improve our understanding of the timing and distribution of sea-floor extension in the geological past. The tectonics of the region are still not well understood. 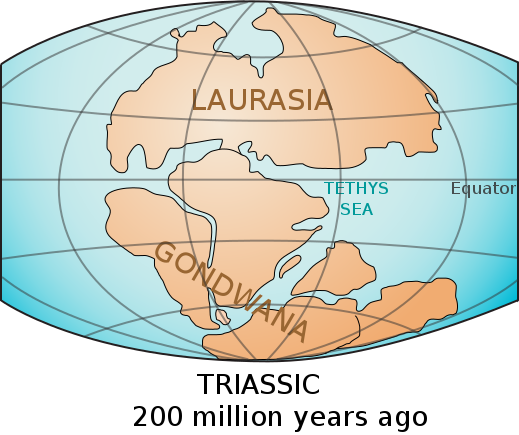 We theorize that the crustal depression that has become the embayment developed during the break-up of Gondwana, the Mesozoic supercontinent composed of modern-day South America, Africa, Australia, Antarctica, India, and Arabia around 200 million years ago. As it pulled apart over millions of years, it stretched the crust in the region of the Ross Sea, thinning and depressing it. Over the past 33 million years, glacial ice has carved out landforms that now lie under the ice. During our work, we will use our instruments to look through the ice shelf and map those present day landforms. We would like to improve our knowledge of the history of the region, both of the geology and of the ice shelf. Why is this important? In addition to increasing our knowledge of the world’s geological history, the past of the Ross Sea can give us clues to its future. If we see evidence that the Ross Ice Shelf has broken up or disappeared in the past, we can say that the present-day ice shelf has the capacity to disappear in the future. Stay tuned for updates on our Antarctic arrival and our scientific work. We’re standing by in Christchurch, parkas on, bags in hand, excited and ready to start another season of Antarctic science. 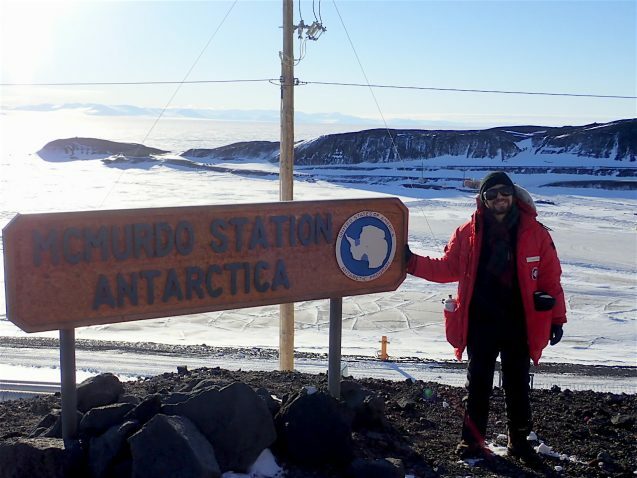 Julian Spergel is a graduate student at the Department of Earth and Environmental Science at Lamont-Doherty Earth Observatory and will be blogging from Antarctica. He works with Professor Jonathan Kingslake on analyzing spatial and temporal trends of supraglacial lakes on the Antarctic Ice Sheet using satellite imagery. He graduated with a B.S. in Geophysical Sciences from the University of Chicago in 2016. He has been involved with a number of diverse projects and has been interested in polar studies since early in his career. His fieldwork has brought him north to the Svalbard Archipelago and south to McMurdo Station, Antarctica. We have embarked! Our third Antarctic field season is underway, putting us only 18 flights away from completing our mission to investigate the Ross Ice Shelf, the largest ice shelf in Antarctica. The Rosetta-Ice Project is focused on developing a more complete understanding of the Ross Ice Shelf, the history of how it formed, the factors driving its current condition, and what might control its future stability. It is this writer’s first Antarctic field season, although traveling to Antarctica has been a life dream of mine since high school. I came to my obsession in an unusual way. In the summer of 2011, a heat wave knocked out the air conditioning units in my town. Sweltering, I took what little refuge there could be had in the public library. I had read somewhere that reading about cold places could cool you down, so for the next few weeks I pored over every account of polar exploration I could get my hands on. I was hooked, and especially hooked on Antarctica. It represented to me a place that remained mysterious and extreme, and whose challenging exploration by scientists represented the pinnacle of human ingenuity and international collaboration. I feel honored to be included in this field season, and to be documenting our findings and experiences for readers to learn from and enjoy. It is exhilarating to be on my way to achieving a personal goal of mine. Though when I pictured myself as an Antarctic explorer as a teenager, I thought I would be taller! 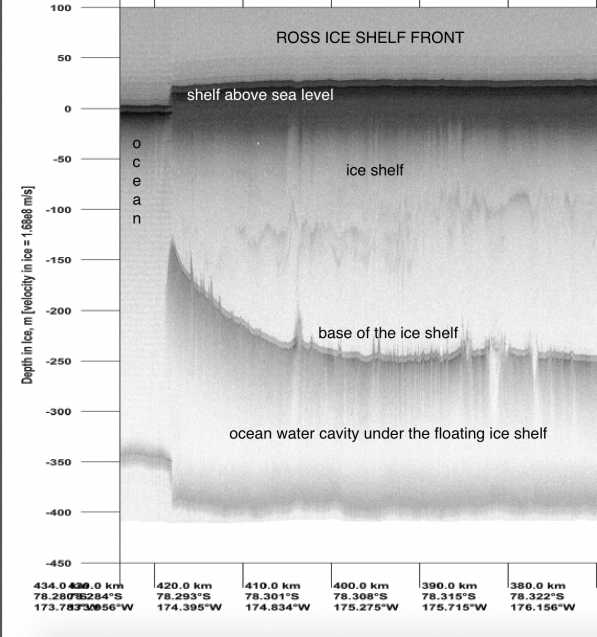 An annotated radar image collected in the project showing the front of the Ross Ice Shelf. Note the shelf sits with most of the ice below the waterline. To more thoroughly introduce the Rosetta-Ice project, it is a multi-year collaboration between Lamont-Doherty Earth Observatory, Scripps Institute of Oceanography, Colorado College, and Earth & Space Research, with funding from the National Science Foundation and critical support from the New York Air National Guard. Our goal is to complete a high-resolution survey of the Ross Ice Shelf in West Antarctica. The Ross Ice Shelf is a floating ice shelf, roughly the size of Texas or France, that extends from the Trans-Antarctic Mountains into the Ross Sea, the portion of the Southern Ocean that faces New Zealand. Part of the ice shelf’s perimeter is grounded, a term that means frozen all the way down and connected at the base to the seafloor below. The rest of the shelf extends out floating as a thick apron of ice with about 10 percent of it visible above the ocean’s surface; the rest floats below the waterline. The ice shelf is up to 4,000 feet thick in its interior, and its margin with the sea is nine hundred feet thick in places. A large percentage of the surrounding ice streams in the Trans-Antarctic Mountains and West Antarctic Ice Sheet flow into the Ross Ice Shelf. As a result, the friction of the grounded portions affects the rate at which the ‘upstream’ ice flows and loses its mass through iceberg calving. Rosetta-Ice is a detailed aerogeophysical survey, a series of survey flights collected using LC130s, rugged military cargo planes that fly equipment and support in the polar regions. 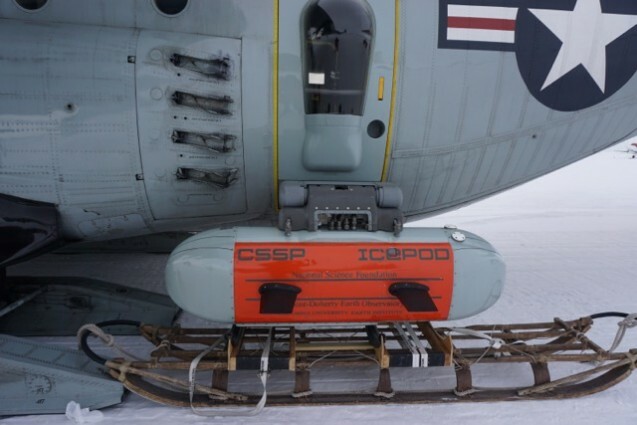 The planes carries a variety of remote-sensing instrumentation inside an attached structure called IcePod, and flies a tight grid of observation tracts collecting data. 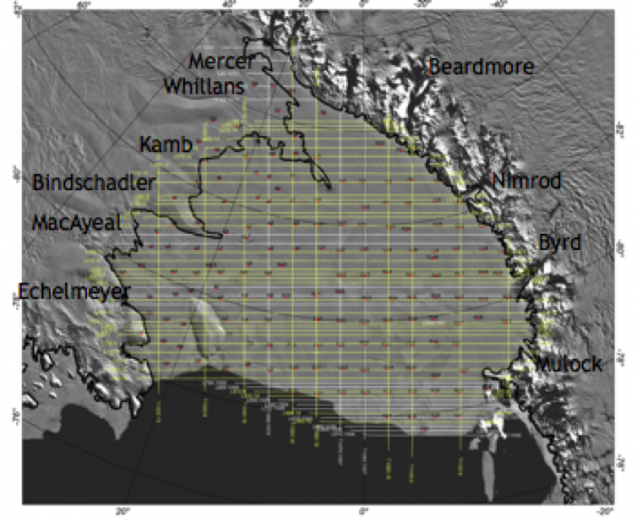 The ultimate result will be a map of the Ross Ice Shelf with a spatial resolution of 10km (6mi). This will give us a comprehensive look into the ice shelf’s surface elevation, its internal glacial layers, its thickness, the ocean circulation beneath it, and the morphology of the bed beneath. The research questions that the project seeks to answer concerns the ice shelf’s past and future. We want to understand how the ice shelf formed, and we are thus studying the internal structures within the ice and the bathymetry and geology of the bed underneath. 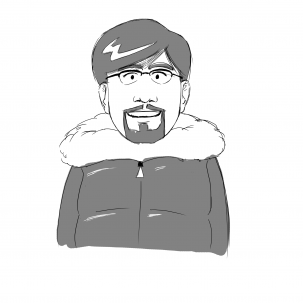 Looking from the past to the future, we are interested in the stability of the floating ice. For this question, we are studying the circulation of ocean water underneath the ice, how the ocean interacts with the ice through melting, and where the ice shelf may be resting on the underlying bed. Each one of our instruments’ data gives us a piece of the answers. The Rosetta Stone, our project’s namesake, was inscribed with a message in multiple languages that could only be completely understood by comparing the three translations and interpreting them together. Likewise, we are interpreting our data from ice-penetrating radar, visual and infrared imagery, magnetic readings, and gravimeter information together to produce a complete picture of the Ross Ice Shelf’s dynamics. In this coming week, we will be settling into McMurdo Station, the largest of Antarctica’s research stations, and setting up and calibrating our instruments so that we can begin this year’s flights as soon as we can. For more information about previous years’ work, please take a look at previous blog entries in the archives of this blog. Julian Spergel is a graduate student at Columbia’s Lamont-Doherty Earth Observatory and the department of Earth and Environmental Sciences. He’ll be blogging from Antarctica for this final season of the project. You can follow along with his posts, and learn more about previous years’ research, here. As we closed out November the project team had completed 18 survey lines and four tie lines from a total of nine flights, producing over 16,000 line km of data. The IcePod and team have been working hard! The closing email for the month of November included these beautiful LiDAR images. Distance = (speed of light X time of flight)/2 in order to account for the distance down and back from the aircraft. The result is the ability to create these three-dimensional images of the land surface. Enjoy these wonderful LiDAR images collected by the project team! The first image is from a standard pass over McMurdo Base in order to calibrate and confirm that the LiDAR system is working accurately. You can clearly see every building, fuel tank, road/pathway and the very systematic way that the base is laid out. The scale bar showing meters of elevation (or height) listed with elevation noted by “Ellipsoidal Height” in meters, not a unit we see every day. We describe the Earth’s shape as an ellipsoid, rather than round or spherical, as the radius at the polar regions is slightly shorter than the radius at the equator. In reality the Earth’s surface is not smooth like an ellipsoid, instead we have mountains, deep valleys, ocean trenches and other surface features with elevation. However, GPS receivers used to locate placement follow a map of sea level using a reference ellipsoid to calculate elevation. 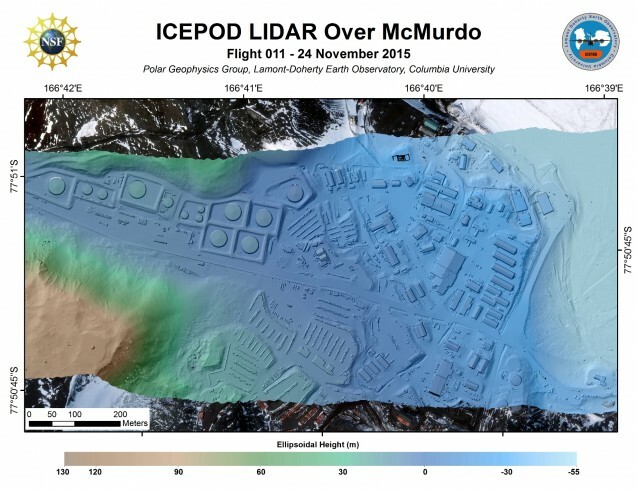 To view these images the best approach might be to look at them as relative measures, for example the image of McMurdo shows a 185 m elevation difference between the the surface at 166°42’E and the surface at 166°39’E. Located close to McMurdo on the Ross Ice Shelf is a small island ~28 km or 15 miles long called White Island. Protruding up through the ice shelf it is named for its covering of snow, and is a sister to Black Island, named, not surprisingly for its lack of snow cover. Both were discovered on the same expedition in the early 1900s. Using the scale for this image you will see the elevation contours for the island peaking at 40 m Ellipsoid Elevation, approximately 80 m higher than the ice at the ice shelf. 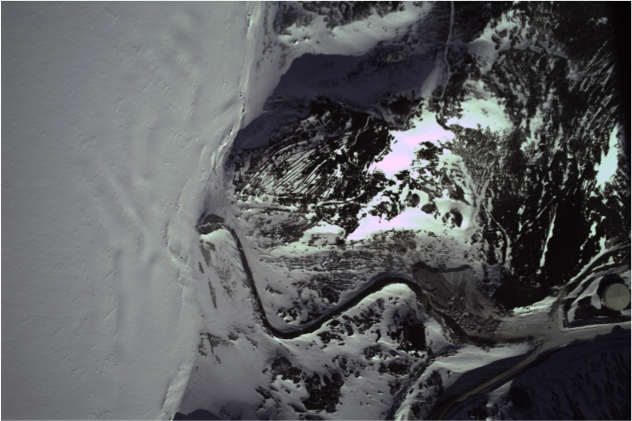 The third image is of crevassing near Crary Ice Rise. What is an ice rise? An ice rise is a region of increase in elevation in the relatively flat expanse of the ice shelf caused by floating ice in the shelf physically ‘grounding’ or touching the seafloor below. It differs from an island as the land in an island sits above sea levels. 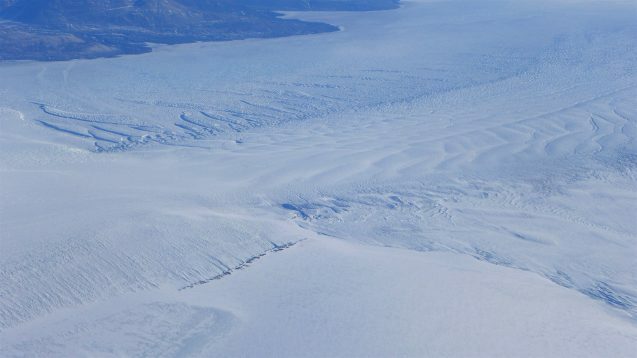 Here the ice is touching land that is still below sea level; it is a section of sea floor raised so that it causes the flowing ice in the deep ice shelf to hit it and drag. This tension of the ice dragging over the contact area, combined with the faster flowing ice around the edges, causes the ice to crevasse as seen in the image. Our fourth image is of seals lying on the ice. The Weddell seal is well represented in the area of McMurdo, although they are also found distributed around the circumpolar Antarctica. Weddells are well-studied by the science community, as they are very accessible, abundant in numbers, and are easily approached by humans. Perhaps they have been imaged in LiDAR previously, but we are happy to have captured them resting on the ice! To provide some context we have included a video of a Weddell seal collected by our project GPS specialist, Sarah Starke. Be sure to check our GIS flight tracker for the most up to date flights! For more about this NSF and Moore Foundation funded project, check our project website: ROSSETTA. 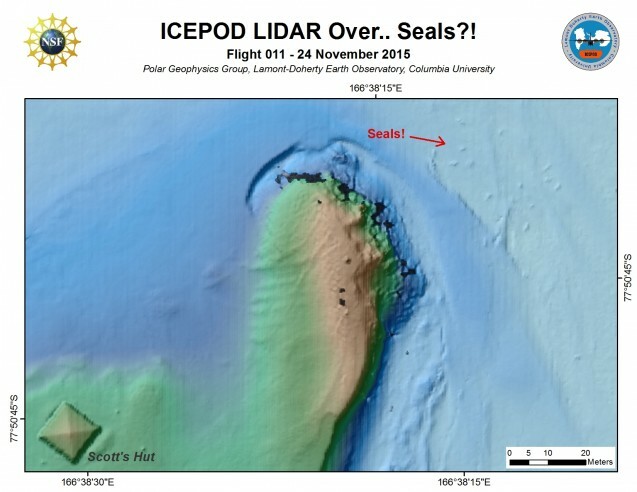 Margie Turrin is blogging for the IcePod team while they are in the field. The project is several weeks in, and with each new line of data we celebrate the collection and then dig into it to see what we can learn. The map is growing, filling in with the 20 km flights designed to provide a framework for the 10 km flights that would fill in the gaps during our next field season. However, already in some instances the team has tightened their grid lines to 10 kms, taking advantage of opportunities in the weather or the inability to collect a line over another part of the shelf. The latest team celebration is around the magnetometer data. Magnetics is used to understand the make up of Earth’s crust. The end goal is to calculate the anomaly or unique magnetic signal from the geology in an area after separating out all the other magnetic ‘interference’ to better understand the formation of this area of Antarctica. The Earth’s magnetic signature varies by location so a base station is set up in order to collect a background magnetic level for the area. During data collection the base station will be used to determine anticipated magnetic levels for the region. Map of Rosetta flights with the magnetic compensation flight noted in the lower right corner. In data processing the local signal is corrected for and small spikes from the aircraft that the instrument is mounted to will be removed. This means that each magnetic survey includes a magnetic compensation flight at high elevation so that the magnetic signature of the plane can be identified. A model is then developed to separate the signal of the plane from that of the geology. The magnetic compensation flight includes flying in all four cardinal directions — check the annotated flight track image above to see a recording of these flight lines. The compensation flight also includes 3 repeat pitch-roll-yaw moves. Pitch includes tipping the wings side to side, roll is moving the nose and tail down and then up and yaw is a rotating or twisting of the plane left and then right. Thanks to New York Air National Guard loadmaster Nick O’Neil we have a video of the pitch and roll pieces of this compensation flight. Note the video is sped up to show 2 minutes of filming in 17 seconds so hold onto your seats! Be sure to note how the vapor contrail of the plane tracks the serpentine movement of the flight pattern during the rolls! For the magnetics the flight line selected was one that has been flown previously by the NASA IceBridge program. Duplicating flights between different projects provides an opportunity to test and validate equipment. 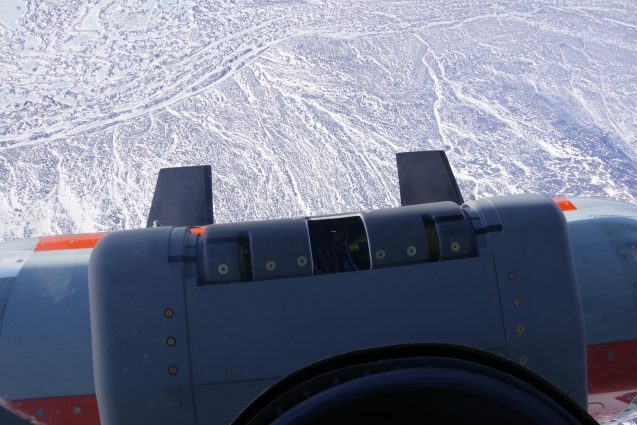 From the onset collecting magnetics data from the LC130 with the IcePod system was considered challenging. The compact nature of the instruments and all the metal surrounding them made this a real test, however, the resulting first unprocessed flight line (below) shows that the shape of the two lines agree! The alignment will only improve with processing against the base station. This is a significant achievement given the very compact environment of the instruments in IcePod – cause for celebration! Magnetics line from the ROSETTA project set against the Ice Bridge line. Right is the volcanic signature of Marie Byrd Land volcanism. The magnetic image shows the signature of this area of Antarctic geology in clear detail. 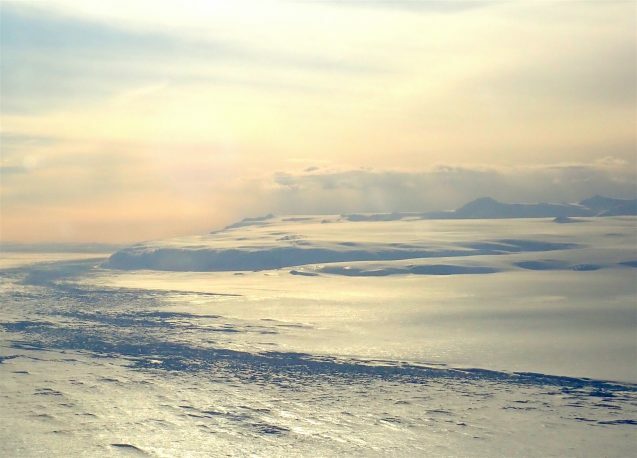 Flying away from McMurdo the Transantarctic Mountains are on the left side of the dataset. The flight moves towards the highly magnetized volcanic environment of Marie Byrd Land in West Antarctica on the far right. Note the elevated magnetics on the right form the volcanic rock. A magnetic high is also visible in the center, yet on the left side the Transantarctic Mountains show no sign of high magnetism. This is not surprising as this mountain range that stretches mainly north to south across Antarctica, was formed from uplift beginning about 65 million years ago, and is composed of sedimentary layers of rock overlying granites and gneisses. Magnetics has evolved quite a bit over the years of geophysical sampling. 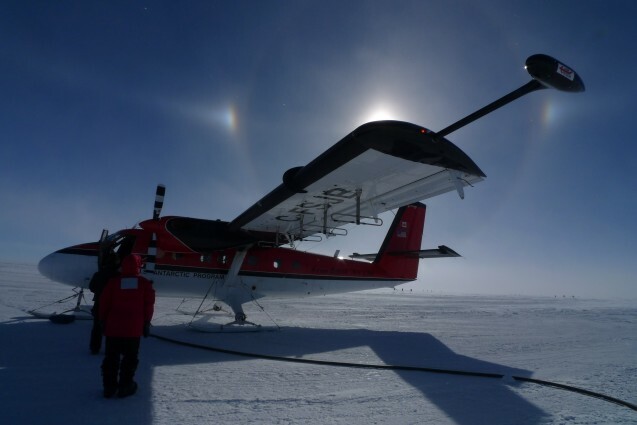 Lamont scientist Robin Bell recalls when in the 1990s when she worked on a project mapping a active subglacial volcanism in West Antarctica that the magnetometer was towed on a winch ~100 meters behind the aircraft. If the wiring got caught up in the tail section it was cut lose and the instrument was lost. 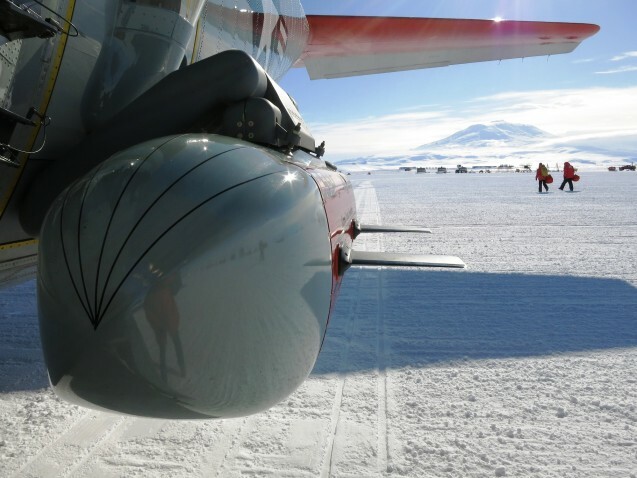 More recent work has located the instrument in the tail of the plane (as in the P3 bombers of World War II) and on the tips of the wings of the plane as was the case during the 2008 AGAP work in East Antarctica mapping the subglacial Gamburtsev Mountains. The IcePod model of placing the magnetics so close to the radar has not been done before. Check out the newest lines on the GIS map and stop back for more. For more about this NSF- and Moore Foundation-funded project, check our project website: ROSSETTA.